Los Angeles, CA-- Landmark television series covering California Court Corruption has been submitted for Peabody Award consideration. The Full Disclosure Network® is releasing the entire series online as a public service here. Available also from 8 minute Segment Titles below. Dr. Richard I Fine describes his battle with the California Justice System and why Judge David Yaffe jailed him indefinitely to solitary "coercive confinement" for civil contempt of Court. Features excerpts from FDN's interview with Fine on March 3, 2009, the day before he was jailed for refusing to obey Judge Yaffe's orders in protest of Calfiornia Judicial Corruption. Retired LA Sheriff's Sgt. Richard Valdemar describes the difficult conditions in L A County Jail while Richard Fine, who holds a Ph.D, in international law is furiously fighting to win his freedom by filing legal actions in Federal Court from his jail cell. Officials ignore the Court Rules to keep Fine in jail. Subtrifuge in the courts is noted by volunteers helping Richard Fine, where important legal documents they filed for him turned up missing or were manipulated. The Justice system, he says, seemed determined to punish him for daring to challenge the corruption. Full Disclosure was blocked from interviewing Richard Fine in jail until Judicial Watch filed a lawsuit to force the Sheriff to grant FDN First Amendment Rights: "Freedom of the Press". 30 Days after the Federal lawsuit was filed, the Sheriff caved in. Sheriff's spokesman Steve Whitmore explains. Richard Fine describes the jail conditions to FDN. FDN's jailhouse interview reveals how Judges orchestrated the persecution of political prisoners like Richard Fine, with the help of Sheriff Baca . In the interview Fine exposes the reasons why the judges were so determined to retaliate and why a lawsuit had to be filed to gain access to to the prisoner who had never been charged or convicted of a crime. Word spread about the plight of Richard Fine, LA's political prisoner sparking a court house protest that was ignored by the mainstream media. Senate Bill SBX2 11 was emergency legislation passed by the California State Legislure in February 2009 to give retroactive Criminal immunity to the Judges and Government officials that had been accused of corrupting the Judicial and Court system by Richard Fine. Segment # 7 - JUDGES BRIBED BY COUNTY OFFICIALS? Judicial Watch public interest lawsuit (Sturgeon vs County of L.A.) held that the County payments to Judges were illegal, The payment of $350 million was a misappropriation of public funds that were never reported by the Judges who are all elected officials, to the Fair Political Practices Commission. Segment # 8 - JUDGES OBSTRUCTING JUSTICE & DEMOCRACY? Richard Fine describes why no one can win a lawsuit against L. A. County and how the Judges decide cases impacting the democratic election process pointing to the court overturning the popular "Term Limit" initiative for L.A. Supervisors, Sheriff, District Attorney, Tax Assessor, etc. Richard Fine claims that Senate Bill SBX2 11 does not provide Judicial Immunity from criminal prosecution when a Judge is involved in obstructing justice. Segment # 9 - PERSECUTION OR "RETALIATION"? Judge David Yaffe ordered solitary "coercive confinement" for Richard Fine to discourage other lawyers from speaking out on Judicial/Court Corruption. Judge Yaffe and his lawyers defended the practice of "coercive confinement in their court filings to keep Richard Fine in jail." Commenting on Judge Yaffe's sudden reversal of his own Order, Richard Fine explains why he refused to obey the Court Order of Judge Yaffe. He also reflects on the prospects of restoring the integrity to our Judicial System. Richard Fine describes Judicial Obstruction of Justice is at the heart of the problem perpetrated by County Officials, Judges and State Bar Association and he points out that Attorneys fear they can be disbarred, like he was, if they try to fight Judicial corruption. When Yaffe finally released Richard Fine, his Order stated his reason why Fine had been incarcerated for 18 months, "to deter other lawyers from challenging Judicial actions." Segment # 12 - IS CALIFORNIA JUDICIAL CORRUPTION REVERSIBLE? What is the future for justice in California? Fine hopes that judicial corruption can be reversed. He says the retroactive immunity from criminal prosecution for Judges and County Officials was given.... was limited by (Senate Bill SBX2 11) and now there is a Congressional move for oversight of the Judiciary as Congress has stepped up to impeach corrupt Judge Porteous from Louisana for the same crimes. It appears there hope for reform in the California system. Retired LA Sheriff's Sgt. Richard Valdemar describes the difficult conditions in L A County Jail while Richard Fine, who holds a Ph.D, in international law is furiously fighting to win his freedom by filing legal actions in Federal Court from his jail cell. Judicial officials & ACLU ignore the Court Rules to keep Fine in jail. List of assets, investments and liabilities, even if jointly owned. Proof of bank accounts and mortgages with statements. Individual financial disclosures to be reviewed and questioned. Positions could be denied based upon the review. Hank Hernandez's prediction of an officer exodus was apparently accurate. As of January 18, 2011 an unknown number of officers have started giving notice they will leave their Gang and Narcotic Units. Hernandez also told Full Disclosure the City of Los Angeles entered into a collective bargaining agreement with the police union in 2003 that was negotiated in good faith, pointing out that under pressure from the Federal Consent Decree (enacted following the Rampart Scandal in the late 1990's) the City was now attempting to impose an "unacceptable" change to that agreement. Hernandez also describes how disclosure requirements don't work. In the video he says that cops stealing cash would never report that fact and goes on to say how the LAPPL planned to counsel officers seeking advice. He noted the perils of turning over personal financial data to an employer and the dangers of identity theft when such information is released. Viewers are asked to participate in an online opinion survey and to post their comments for discussion. Which Gang Gets The Government Money? Why Are We Losing The War Against Gangs? What is The Full Disclosure Network®? 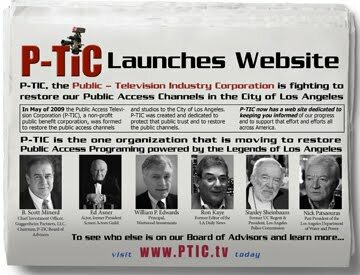 Los Angeles, CA --The campaign to protect and restore Public Access Television studios and channels has begun in the heart of the media capitol of the world, in the City of Los Angeles. The Public Television Industry Corporation (“PTIC”) has launched a website to attract supporters and television producers to join the cause. The PTIC chairman is B. Scott Minerd, the Chief Investment Officer of Guggenheim Partners. Other Founding Members of the Board are Stanley Sheinbaum, ACLU Free Speech Advocate, actor Edward Asner, past President of the Screen Actors Guild, Ron Kaye, former Editor of the L A Daily News (1984-2008), and many more. To view the entire list with bios, please visit the PTIC website. The new website, located at http://www.ptic.tv/, is encouraging visitors who want to join the campaign to sign up to receive email newsletters on developments. Producers with programming they want aired on public access channels can learn how they can participate with PTIC to submit their programming. PUBLIC HEARINGS: TO WIN BACK PUBLIC ACCESS CHANNELS? PTIC Newsletters feature important news and hearing dates when the City and County Governments hold Budget Hearings to disperse the millions of dollars earmarked for public access TV. The newsletters are to keep PTIC subscribers on top of the issues and remind government officials that PEG trust funds were set aside specifically to provide for Public Studios and Channels. PEG stands for Public, Education & Government and, under state laws, the approximately $30 million in Cable and Telecom Franchise Fees the government entities in Los Angeles area received are to be used solely to support the PEG channels in the area, not converted to other uses. Four-part series covering the history of Public Access TV, featuring: Producers, Actors, Directors, Civic Leaders and Government Officials. Revealing how we lost the public channels due to State Legislation, and who was behind the campaign to silence the public. Hear from Producers about the tragic loss of the public's voice in our communities.